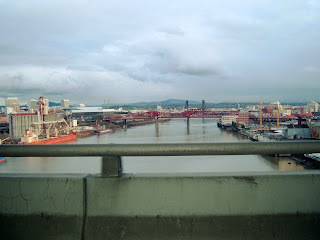 This is our last post from Portland. The 11 days went by too fast. Our last day began with some motor home maintenance. Then we were off to Safeway for a few groceries, and then on to lunch with Michelle and family. We met at to a wonderful Japanese restaurant. Ian and I went for the sushi combo which had salmon, shrimp and eel among other things. It was great. Judy and Michelle had the Bento. I'm sure it is available in other areas but Portland is the only place we have seen it. Bento is basically an Asian box lunch. Judy's bento had salad, spicy chicken, tofu and California roll. All neatly arranged in little compartments in a box. A feast for the eye as well as the stomach. After running a few more errands, we found a little French patisserie that Julie had recommended. It brought back wonderful memories of being in Paris. We had a great cup of coffee and a chocolate brioche, that we shared. Need I say more. As this was our last evening together before we left Portland, Michelle and Ian invited us, and Julie , and Jeremy over to their apartment for dinner. They prepared a wonderful meal of baked salmon with couscous. It was excellent. Michelle also surprised us by giving us a very nice personal scrapbook of our Portland visit that she had been working on. Of course that was enough to make Judy a little teary eyed. We have always wanted our kids to be independent and worldly. Not in a material sense but an awareness of this great big world we live in. Of course they could have done it a little closer to home.I must tell you it is a challenge to see everyone in person now that we have kids on both coasts and one in the Midwest. Sometimes email or phone calls just aren't enough. You gotta hold em. If you are a parent I don't need to say more. We enjoyed our stay and it was great to be with Michelle and Ian, Julie and Jeremy, and Nemo and Mia. We left a piece of us in Portland, but we take with us precious memories. You both are so sweet...excellent writing, I must say. I'll look past the typos this time and give you an "A"!! We had such a great visit. Hopefully we can see you again before next February rolls around. This is actually from Michelle, not Ian...though he enjoyed your visit, too!